"The Precious will be ours!" Even if I were inclined to do so, it's hard to argue with more honors, awards, and accolades than just about any other film in history. With its historic sweep of the 2003 Oscars, Peter Jackson's amazing epic of imagination logged a permanent place in the history books. And even though the finale's not to my mind the best of the series, it does provide an elegant cap to an epic that has become beloved by millions the world over. For those lost in the Mines of Moria for the last few years, this third part of the story concerns hobbit Frodo Baggins (Elijah Wood) who is making his way to the realm of Mordor ruled by the Dark Lord Sauron, aided only by his gardener and friend, Sam Gamgee (Sean Astin), and their treacherous guide, Gollum, to destroy the One Ring, which contains the life force of Sauron. Disparate threads are tied together between the one following another pair of hobbits, Merry (Dominic Monaghan) and Pippin (Billy Boyd), and that of the remaining companions of their fellowship: wizard Gandalf (Ian McKellen); Aragorn (Viggo Mortensen), reluctant heir to the throne of Gondor; wood elf Legolas (Orlando Bloom), and dwarf Gimli (John Rhys-Davies). The forces of the Dark Lord are mighty, however, and they come to bear with terrible force upon the city of Minas Tirith, and the companions must find a way to survive and buy Frodo and Sam enough time to make their way to Mount Doom where the Ring can be destroyed. Zero time, however, is spent on recap, so audiences new to the film are well advised to see the DVDs of the first two pictures. The three films, even though they were shot together, fit as a whole surprisingly well in light of their highly disparate settings. But releasing the three, one at a time, also allowed Jackson the luxury of seeing what worked and what didn't, applying the lessons as he went. For instance, his hyperkinetic camera in Fellowship of the Ring is significantly toned down in the subsequent films, but it's still present to some extent so there isn't a jarring difference of style. It helps that the same cast was available throughout and for the extensive reshoots, and even more importantly, that Howard Shore was able to thread his leitmotifs throughout all three pictures and weave a memorable aural tapestry that holds it together, not as a trilogy, but as a single massive motion picture. The effects work just keeps getting better and better, and the crowning achievement is of course the computer-generated character Gollum. Unlike other efforts at CGI characters, Gollum has life breathed into him to a level never before approached, simply because it is tied so closely to the vocal and physical (and motion-captured) performance of Andy Serkis. Considering how little of what's onscreen is practical, the wide variety of effects techniques, from CGI to miniatures to simple camera trickery, work very well. A few moments, such as the notorious scene of Legolas climbing the Mumak, have a bit of a look of a video game, but it's frankly astonishing how little of this there is in a movie that really creates a visually credible fantasy world. The Massive software program that generates battle sequences seamlessly blends with real actors and miniature sets, so that much of the time I frankly had no idea what was real and what wasn't. But it's unfair to emphasize the effects work over the cast; it would be pointless to have all these effects without a human element. Jackson wisely doesn't make this an effects movie, but keeps it an organic one that uses its effects to bring a heightened reality to it. And that has made all the difference. Even though the Academy didn't nominate any of the cast, such a huge ensemble isn't really appropriate for that type of consideration in any event. Sean Astin really stands out as doing a terrific job with his Sam, devoted to a fault to Frodo and heartbroken when Gollum manages to drive a wedge between them. Even though I've now seen this film six times, Astin always moves me to tears, as does the climactic combat of Eowyn (Miranda Otto) and the Witch King of Angmar. For those who were unmoved by the first films, poor souls, you won't find much to enjoy here. Everyone else will be well advised to watch the three closely together, because they do intertwine into a single story and things mentioned or seen briefly hours before pay off at last here. Image Transfer Review: Unsurprisingly, the source print is pristine in its quality. As usual on the R1 DVDs, there's too much vertical filtering applied so the picture's softer than it really needs to be. Much of the time this isn't an issue but there are moments when the softness makes it difficult to make out expressions of characters seen at a distance, even though they were readily visible in theaters. Color and black levels are, however, as usual, excellent and edge enhancement is kept at fairly reasonable levels (though much of the movie is intentionally so dark that EE would be difficult to make out in any event). Audio Transfer Review: Once again, the theatrical version of the film gets a highly aggressive mix. If you have a subwoofer that can hit the depths at high volume, you'll be glad of it here. There are also much subtler audio touches, including very precisely placed directionality throughout. I had zero complaints but it may be a touch too loud for sensitive ears. A highly immersive and foundation-shaking 5.1 track. Extras Review: The second disc is packed full of previously released material, none of which is essential or anything that fans haven't already seen. Two documentaries that aired on television to promote the release of the film tend to be quite repetitive (and in fact reuse some of the same interview footage and film clips). The third documentary is the National Geographic special discussed elsewhere on this site, and which by itself sold for nearly as much as this two-disc set. 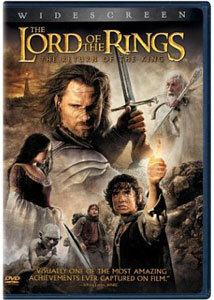 These are supplemented by six featurettes that were originally on lordoftherings.net, covering various thematic elements and technical issues. Oddly enough, the best of the lot, devoted to Gollum, is unaccountably missing here. There is no "Play All" button, which is a mild irritation. A pair of anamorphic widescreen trailers and a "supertrailer" for the entire trilogy are supplemented by an amazing 14 TV spots (thankfully, a "Play All" option is provided for them). A video-game promo and a DVD-ROM link round out the set. Chaptering is pretty good, but the layer change is very halting and badly placed. I'm getting increasingly tired of elaborate, slow-moving menus, and this is another offender in that category. Simplicity, please.